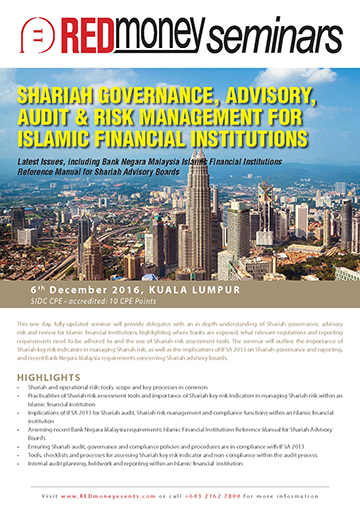 This one day, fully-updated seminar will provide delegates with an in-depth understanding of Shariah governance, advisory risk and review for Islamic financial institutions, highlighting where banks are exposed, what relevant regulations and reporting requirements need to be adhered to and the use of Shariah risk assessment tools. The seminar will outline the importance of Shariah key risk indicators in managing Shariah risk, as well as the implications of IFSA 2013 on Shariah governance and reporting, and recent Bank Negara Malaysia requirements concerning Shariah advisory boards. Bank Negara Malaysia: Islamic Financial Institutions Reference Manual for Shariah Advisory Boards – should this be reflected in the title? It’s new.